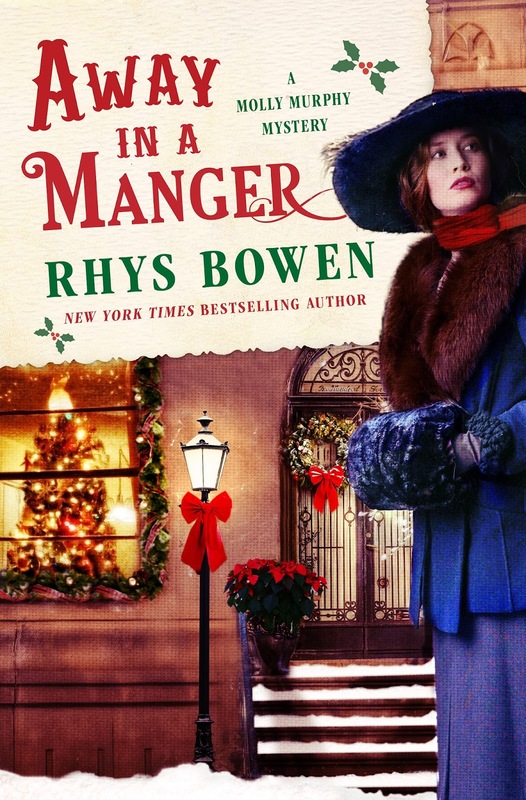 RHYS BOWEN: Today I am celebrating the publication of a Molly Murphy Christmas book called AWAY IN A MANGER. This book is in addition to my regular Molly book that will come out next March. Yes, I wrote three books in the last twelve months. Crazy, I know. One of the things I liked most about writing a Christmas story was the chance to relive an old fashioned Christmas. Have you noticed how hard we try these days to make Christmas special? Decorations appear in the stores right after the back-to-school sale these days. I see people buying new decorations even though I’m sure they must already have plenty. In about a week’s time we’ll start on the TV Christmas specials—Rudolf and Frosty and all the old favorites. And of course we’ll all fight to buy our Christmas gifts on Black Friday, won’t we? Actually not me. I do my shopping online these days. I think one of the reasons we try so hard is that we want something that doesn’t exist any more. We want that perfect holiday from the Christmas cards—the cottage in the snow with the sleigh bells and the smells of baking and the family gathered around the fire, children with faces aglow as they await Santa Claus. And the harder we try to capture that feeling, the more elusive it becomes. I know I’ve tried hard enough. One year a German friend was bemoaning how commercial Christmas is in the States and how she longed for that simple snowy celebration from her youth in Europe. Why don’t we rent a house in the mountains for Christmas, she suggested. So we did. Horribly expensive but we wanted to give our children the taste of an old fashioned Christmas. When we arrived it looked just like a Christmas card scene. Snow heavy on the roof and the surrounding pine trees. The smell of wood smoke in the air. The next morning we took the children skiing. And mid way through the morning the snow turned to rain. And it rained and it rained. It washed away the snow and kept on raining—too hard for the kids to play outside. We were stuck in a cabin with no TV and six stir-crazy children. So much for the perfect Christmas! One year when the children were grown we decided we would forget commercialism and give only home-made gifts. We all worked on them secretly—the candles and fleece pillows and bead necklaces and brownies. Then we exchanged these gifts and tried to be delighted and excited. Then someone cracked and said, “I did actually go out and buy a little something for everyone, just in case.” And it turned out everyone had done the same. The closest I’ve come to the old fashioned Christmas was when John and I took a Christmas market cruise up the Danube river, stopping at all the little towns with their markets in the main square. The booths were strung with lights and the air was full of good smells—gingerbread and sausages and mulled wine. There were wooden ornaments and toys and children, bundled against the cold, stared in wonder. I loved it. John not so much. “How many angels do you need to look at?” he’d complain. When I think back to the Christmas of my childhood it was really so simple. My main presents were a sweater, a long playing record (remember those? ), a pair of boots, a book. But it was the one time in the year that we had turkey and tangerines and we pulled crackers and sat around the fire and played silly party games like charades. I try to recreate that feeling with my own family but the truth is that we have too much the rest of the year. Turkey isn’t a treat. We have plenty to eat every day. We go out and buy a new sweater when we need one. It was the simplicity the rest of the year that made the holiday season so special. In times of plenty what is there to look forward to? This may be one of the reasons that Christmas books have become so popular. A chance to step back in time to enjoy the old fashioned Christmas without the commercialism. In Away in a Manger we see Molly baking and taking her little son to see Macy’s department store windows. When they see a beggar child singing with the voice of an angel Molly’s ward is convinced she is an angel come down for Christmas. But finding out who she really is and why she speaks so nicely with an English accent will take Molly from the dangers of the dockland to the highest levels of New York society. I hope you enjoy Away in a Manger. Maybe you’ll find some suggestions for your celebration this year. I’ll be giving away a signed copy to one lucky commented today. My early Christmas gift to you. And if you didn’t have the chance to read my earlier Christmas book, The Twelve Clues of Christmas, it will be a Book Bub special for most of December. Enjoy. The commercialization of Christmas is so frustrating, but i think family traditions can bring meaning to the holiday and perhaps meaning is what old-fashioned Christmases are really all about. We have traditions in our family . . . Christmas Eve candlelight service [with the youngest ones in the pajamas] where we sing "Silent Night" at midnight . . . cinnamon rolls made from scratch following my mother's recipe. Smiles on the faces of the Little Ones are the best gifts of all. I am looking forward to reading Molly's Christmas story and discovering her special holiday traditions. Can't wait to read Molly's latest adventure. Christmas is so anticipated and can be such a let down. We need to work on that. WOw, fabulous. Cannot wait o read this--will it make me cry? And your essay is so lovely and sweet, and so touching. And theChristmas in the rain story..argh. Joan, I can smell those cinnamon rolls! I know just what yo mean. We allays got Droste's chocolate apples, remember? This kind you whammed and they broke into slices. It is shocking how early the christmas and holiday stuff goes up. It's the impatience of the world, you know? Taking something special, and wanting it NOW, like Veruca Salt. The book sounds fabulous, and truly I love the idea of an "old-fashioned Christmas" -- pure fantasy. Growing up my parents made a big deal about the holidays. A huge tree that we shopped for the day before Xmas eve and decorated Xmas eve, which mad coming down to it Xmas morning so special. A million gifts. And of course I loved it. Most of all it was a safe, predictable time when everyone was on their best behavior. Every year I dig out a box of children's Christmas books: Arthur, the Grinch, Holly and Ivy, Max and Ruby, Madeline, Polar Express, The Year of the Perfect Christmas Tree. I re-read The Best Christmas Pageant Ever,and L'Engle's Twenty-Four Days Before Christmas and remember all the good things about a simple Christmas. Lovely post Rhys, and the book sounds delicious! It gets harder and harder to pull everyone together for big holidays because the family is scattered all over the place. There are some things that make Key West feel pretty special at Christmas--lights and palm trees go together amazingly well! We will have a gang for Christmas Eve--we'll be going to the service of lessons and carols. And trying to come up with a menu that feels special but doesn't mean spending the day in the kitchen when everyone wants to be out playing! When I was a child, lo those many years ago, we got fruit in our stockings and needed underwear and clothes wrapped and put under the tree. If I was really lucky I got a book that I had requested. It was fine because there was no TV, etc. to tell us what we should want. Hank, you are definitely going to cry, but in a good way. My daughter recently commented, "Christmas isn't magical any more, Mom. It's just another day." Of course, she doesn't believe in Santa now - neither of my kids have. And my husband has tried to move the day from thinking of presents to more esoteric things - thinking of the birth of Christ and the world - things that are still hard for kids who are 15 and 13 to grasp. I'd love to reverse this, but not sure how. Pulling my daughter out of her room and getting my son to put away the doggone computer would be a start, I suppose. I was just thinking about how Christmas has changed since I was a kid. When grandparents were still around, and everyone had a central meeting place for the holiday. Now, with family so spread out, it doesn't feel quite like the holidays anymore. Just my mom and I watching TV and playing with the dog. Of course, that's nice in it's own right too. Having Christmas with a young kid in the house brings back ALL the magic. Also, midnight mass at St. John the Divine in NYC. And books, too, of course! I always thnk of Little Women as a Christmas story: "Christmas won't be Christmas without any presents..."
I always feel a little sad when the Christamas season begins and I think you've hit on why. We have so much so fast now we don't anticipate that special gift or those special events or just taking time to enjoy the season. And you're right about Christmas books. 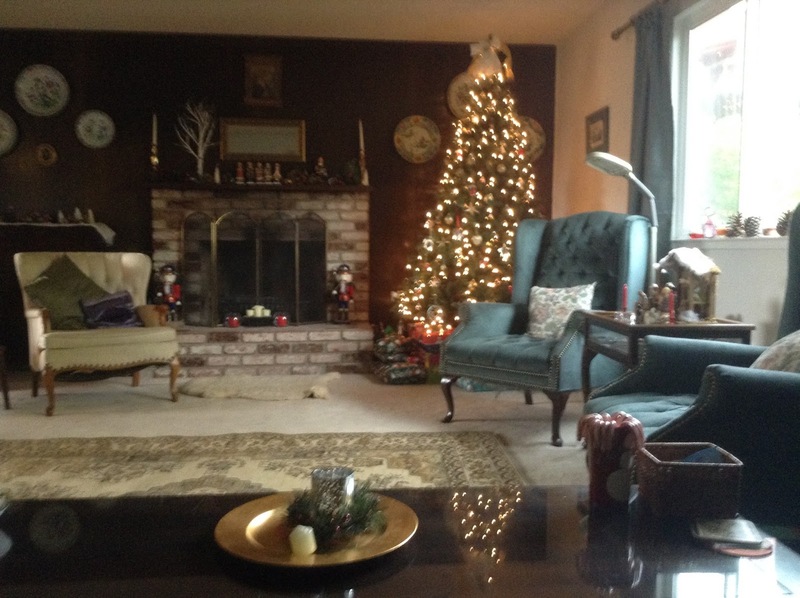 They take me into the old fashioned Christmas that didn't seem like one giant chore list. When we were children we knew we would never get the #1 item on our list, but that was okay because we would get something off the list, plus new PJs and books from my grandmother, and nuts and oranges and Cracker Jack and tiny gifts in our stockings. I like to ease into the season and build up the anticipation, but it is almost impossible these days with jumping straight from Halloween to Christmas in the stores. Watching all the little ones does bring back the magic though and we are thankful for Skype so we can see the 5 littlest cooties. Having read an ARC of Away in a Manger, I can tell you it's like having a mug of mulled cider with a cinnamon stick to stir, curled up under a soft throw in front of a fire, Christmas carols playing softly in the background as you are whisked away into a magical time and place with endearing characters. Oh, and keep the kleenex near, just in case! Two teenage boys in the house--they want the tree, decorations, presents good but optional, and special food--homemade fudge from their grandmother's recipe, all-but-the-kitchen-sink cookies, etc. Friends and family coming in and out--and Christmas becomes more than just another day. There were just the 4 of us in MN in the 40s-60s, but many wonderful memories. Today my kids and families are scattered across the country and my day will consist of memories, phone calls, a good book and, of course, cookies on a Christmas plate. About fifteen years ago, I read a couple of books that helped me change Christmas into something more meaningful for my family: Unplug the Christmas Machine and The Hundred Dollar Holiday. The primary take-away is that the reason old Christmas traditions were so magical in their time is because they were based on scarcity. In the days before television, radio or cinema, seeing the decorated windows at Macy's would have been an amazing spectacle. When your diet was limited due to finances or availability, sweet treats like cookies and candies and oranges were precious. When someone had to spend a month or more knitting you a sweater, you were grateful to receive it. Of course, as Rhys says, now we can eat whatever, whenever and buy our own factory-made clothing off the rack. So the trick is to identify what are your areas of scarcity. Time together? Time spent outdoors? Gathering with friends? Real, home-cooked food? Eating out? If you make those things the center of your holiday, you'll feel like you're experiencing something special. Because you will be! So in my family's case, we love hosting all our friends for a huge dinner. We only do it on Christmas and Easter (and some years Thanksgiving,) so it's rarity makes it a delight instead of a chore. We love live music, and don't get much of it due to the cost of tickets, so we go to the Portland Symphony's Christmas concert. We spend a lot of time together playing board games, something we don't make time for during the rest of the year. We all go out to see one of the big holiday season movies. Try sitting down with your spouse or friends or family and asking them what they really love about the holiday, what they could live without, and what they don't get enough of in their lives. The answers may surprise you! You're so right, Julia. My grandmother got an orange, wrapped in foil, in her stocking as that was a huge treat. For me getting the family together is biggest present and having the money to fly them all in gives me great pleasure. And I always take my granddaughters to the San Francisco ballet's the Nut racket. Now they are teenagers I ask if they still want to go and they look shocked. Of course they do! Don't you love auto correct? Nutcracker became nut racket! "It was the simplicity the rest of the year that made the holiday season so special. In times of plenty what is there to look forward to?" Look at children's birthday parties. They are so over the top extravagant at such early ages, that there is no where to go with them. Thank you for an excellent essay and a lovely book to get lost (or, perhaps, found) in. Yay! I'm so excited! I actually added the release date to my calendar, so it was the first thing I saw on my phone when I woke up this morning! It definitely put a smile on my face! 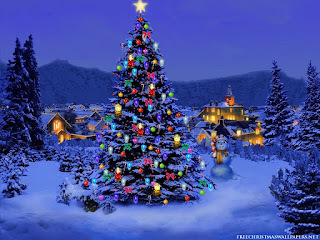 I love Christmas books, mysteries and your books. What could be better than a Christmas mystery written by you! Thank you for writing it. I can't wait to read it!! Wah! I pre-ordered the book and was so looking forward to it, but it didn't come this morning! Bah humbug! I love Christmas, but we don't do a lot. Usually Christmas Eve at my in-laws--hubby has four sibs, all of whom have spouses/partners, and kids, and now one grand-niece--so it's a big noisy party. For years we went to my aunt's on Christmas Day, but a couple of years ago we had the most magical Christmas. We got snowed in. Literally. On Christmas Day. We knew there might be bad weather so we had food just in case. The four of us stayed home in front of the fire, watched Christmas movies, and played games. And ate, of course. It was the best Christmas we could remember, so now we are making an effort to do that, snow or not. And I was always just exhausted from two big get-togethers in two days. My daughter and I like finding little fun things for each other's stockings, and stuff for the guys, too, of course. We like giving gifts, too, but nobody goes overboard. It's all pretty relaxed. And I love the Christmas tree, that's my big thing, as I'm sure I've mentioned before. When I was child I always got an orange in my stocking, so we still do that. I got a book, and when I was older, a record, a toy, and something to wear. Kayti and I still give each other books. "Christmas wouldn't be Christmas without any books," to paraphrase! And next year, oh, that will be so much fun! Loved "Twelve Clues of Christmas" and look forward to this! Like many families, ours gathers rather piece-meal for Christmas. This year I will do a Boxing Day brunch for my children and grandkids (missing only one daughter and son-in-law). I'll make my "famous" cinnamon rolls (biscuit dough!) and we'll distribute presents. I hope it will feel "old-fashioned." I always set an extra place or two for Christmas dinner... my feeling is that there is always room for one more, room for love, room for someone who has no other table to sit at, or people to spend the day with. I try to keep that alive all year round, but most especially at holidays. The Thanksgiving and Christmas holidays are still magical to me, even though they will never again achieve the wide-eyed wonder of my childhood. It's all about family (and food), of course. Nowadays our younger son and daughter-in-law have to be mobile at the holidays to accommodate both families (hers is MUCH bigger than ours) and we never know where (and when) we will be celebrating Christmas until (hopefully) the month before. But as long as we're together, sharing a warm home, the most precious company ever, and some food we only eat during the holidays, we're very happy. 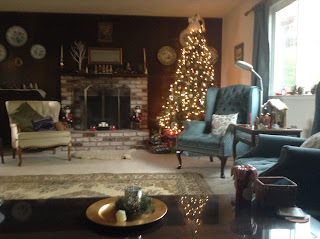 But it is the joyous memories of past Christmases that fuels my contentment with current celebrations. Looking forward to the new book. I, too, was lucky enough to receive an ARC for Away in the Manger, and FChurch described perfectly how it felt reading it. I was truly transported to a world of simple joys and pleasures, where that one special gift was treasured and appreciated, no looking for the next one and the next. I am featuring Away in the Manger on my blog today (http://www.readingroom-readmore.com/) with a spoiler-free review. I'm posting the link only to make sure that everyone knows what a wonderful bonus gift this book is from Rhys. Rhys, you've worked hard and deserve a restful, magical Christmas yourself this year. Even though I received an ARC, I'm buying at least one copy to give as a Christmas present. Oh, and Hank, yes, you will cry. Lucy, one of my best Christmas dinners was in Key West, a simple but yummy one. When my daughter and son-in-law lived there for a year, both families went down to visit for the holiday. The guys and my daughter (she's always loved to fish, due to her grandfather) went out in the morning and caught cobia, which just happens to be the most delicious fish ever. My daughter's mother-in-law is an expert at grilling fish, so we all had well satisfied tummies that day. I enjoy the activities around Christmas these days as much as the actual day. This year I planned a special event for the older granddaughter, who is a freshman in high school. The other grandmother and I are taking her to see The Piano Guys and out to dinner before. We are going to dress up and make it a grown-up ladies' evening, and my granddaughter is very excited about it. I remember how when I was twelve-years-old, my Christmas changed from being a kid and it pretty much centering around that to my older sister's new baby and it centering around that. I got over my the baby usurping my place pretty quickly, but I wanted to do something for my teenage granddaughter that would make her feel magical, too. Of course, the younger granddaughter, who is six, looks at everything as magical, and we'll be doing some younger kid stuff, too. These days we gather at my daughter's house and get to see what the kids got from Santa and exchange presents and eat a lovely potluck meal. I still help out on the kids' stockings, as one of the things I love most is finding little extra touches. I just finished Away in a Manger - found it on my Nook this morning! Loved it. Molly, Si And Gus made Christmas pudding and it reminded me of my Scottish grandmother making her steamed pudding every year! Love the story! I love Christmas and with me it's all about the family getting together to celebrate Jesus. I was looking at nativity scenes the other day and my husband reminded me that one of my daughters last Christmas said, "Mom, how many nativities does one house need?" They obviously think I have too many, but I disagree. The Christmas book that I read every year without fail is The Story of the Other Wise Man by Henry Van Dyke. It is awesome in the truest sense of the word. As for gifts, we always say we won't do too much, but every year we have trouble with that. One tradition that can never go away is that everyone gets a new pair of socks in their stockings. One year I did something else instead and my daughters and sons-in-law were incensed that they didn't get a new pair of socks! The perfect Christmas always involves children! Their anticipation and excitement makes the holiday magic. First it was my sister's children. Now it's her grandchildren. For more than 30 years, I have spent Christmas with my sister's family. I drive in on Christmas Eve, with bags of presents (no matter how much we say we'll cut back!) and spend the night. Christmas Eve is spent watching as many versions of "A Christmas Carol" as we can fit it (George C. Scott, Patrick Stewart, Muppets, etc.)! I always bring a Christmas jigsaw puzzle, which we start Christmas Eve and finish Christmas Day (max 750 pieces, please!). As many of the remaining family members as can show up on Christmas Eve, also (crowded!). The rest come Christmas Day. As for food, Christmas Eve is ALWAYS tamales and chili (Texas here), with Christmas Day being more Tex-Mex favorites (pre-prepared), chips and dips, vegetables and dips, fruit and dip, with yeast rolls and ham for mini-sandwiches. Our big pull-the-stops-out turkey meal is always Thanksgiving. Who wants to cook Christmas Day? Rhys, the new book sounds wonderful. I'd be happy to take it off your hands! Three in one year? I salute your stamina. Yay, another Molly book! I can't wait to read it! Rhys, Away in a Manger sounds lovely, and I am looking forward to it. I think you are right about the truth's being the general state that "... we have too much the rest of the year." My church in California had pre-season workshops to help families and individuals without families or other connections create new holiday traditions. It was well-received and ongoing from year-to-year. In books ( and memories) we can have the perfect, simple, heartfelt celebrations, and then go on to appreciate messy reality. I am heartened by the businesses opting to be closed on Thanksgiving . . . it's a start ;-) Looking forward to this angelic tale. My copy of "Away in a Manger" arrived this morning, but I'm going to hold off reading at least until after I conduct seminars at three local libraries on "A Christmas Carol" and "The Haunted Man," two of Dickens's Christmas Books. And I have to hear Brenda Lee sing "Rockin' Around the Christmas Tree." I stumbled across your books (Her Royal Spyness) by accident and completely fell in love with them. I was so intrigued; I started reading everything in the series and couldn't wait for a new release. Getting a signed copy would be a dream and I cannot wait to read Away in a Manger :). P.s. I am also eagerly awaiting the next Royal Spyness book. Sorry I wasn't able to stop by yesterday. Congrats on the new book. Mine is on the way from Barnes and Noble as we speak, and I can't wait to read it!! I am so looking forward to reading this one. I've just got caught up on all the Molly books and am ready for more! Thanks for the heads up about the Book Bub deal too!